Ontario has a vast and diverse wildlife population. Seeing animals in the wild is a wonderful experience for many people. However, sometimes there are human-wildlife conflicts. Although wild animals can become a nuisance, they don’t usually threaten human health or safety. The least traumatic and least expensive way of dealing with wild animals is to animal-proof your property before wildlife moves in. By vaccinating and securely confining pets, and teaching your children to respect wildlife and to leave wild animals alone, you can reduce any risk to human health and safety. The Ministry of Natural Resources and Forestry has posted information online to help landowners with nuisance wildlife. Please visit the Ontario Government's Wild Life and Nature page. Listed on that page are links for preventing and responding to problems caused by specific wildlife species. The municipality also plays a critical role in preventing and dealing with nuisance animals. In July 2013, the provincial government made changes to the Fish and Wildlife Conservation Act to enable municipalities to compensate hunters or trappers for the removal of coyotes and other furbearing mammals (such as raccoons and skunks), without Ministry of Natural Resources and Forestry permission. The coyote is a natural inhabitant of rural areas particularly near ravines and wooded regions. Some residents welcome coyotes as part of the local wildlife, while others are concerned for the safety of their pets, children and families. Coyotes can occasionally cause problems in rural areas as they are predators to livestock such as sheep, poultry and calves. There can also be concerns related to damage to garden crops, foraging through garbage and the possibility of them preying on domestic pets such as cats and small dogs. It is important to note that there are only a few documented cases of coyotes attacking people in Ontario. Properly store and maintain garbage containers. Do not store or leave pet food outdoors. Consider the use motion-sensitive lights in yards or gardens. Normally, coyotes pose no danger to adults but people should be aware that there are potential risks to pets and small children. Coyotes, by nature, are fearful of humans. Attacks by coyotes on people are very rare and there are only a few documented cases in all of Ontario. In all known cases of coyote interactions with people, the coyote had lost its fear of humans because people were feeding the animals. The coyote is a small relative of the wolf, weighing on average between 15 & 20 kg. Their thick fur may make them appear to be larger. The colours of coyotes vary from blonde to reds to browns. 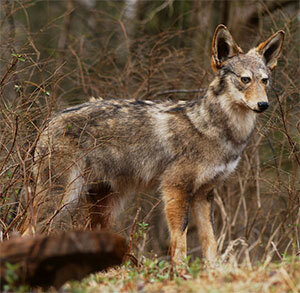 Coyotes are very adaptable and can do well in any area that includes forest cover. They inhabit natural valley lands & ravines. They provide benefits to agricultural and urban areas by assisting in the control of small mammals such as mice, rabbits & groundhogs. Coyotes are most active at dusk, dawn and throughout the night. Coyotes do not hibernate and may be seen all year round. Coyotes are generally shy, cautious and non-confrontational, but can be curious and experimental.